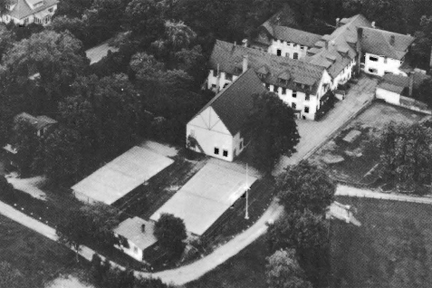 "The Grove" as it appeared from the air in 1949. 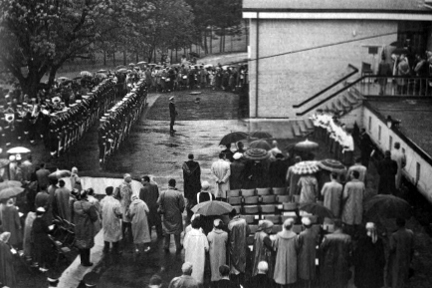 The new classroom wing is opened by the Honourable Vincent Massey, the Governor-General of Canada, in 1958. Part of the tunnel can be seen on the middle right side of this picture. In 1879 "The Grove" as Lakefield College School was first known was started by Sparham Sheldrake. It was a farm with barns and a large farmhouse and could accommodate 15 to 20 boys. Over the years "The Grove" grew. It sent young men off to both the great wars and lost many promising alumni who might have gone on to greater things. But still the school survived and grew. In the photo on the left, Grove House is the building complex in the upper right. The Great Hall is in about the center and the open area next to the Great Hall was where the new classroom block would be built. The area to the right of the Great Hall (hidden in this picture by a large tree) was where the tunnel would be. We pick up the story in 1958 with the construction of the new classroom wing. The downside to building the new classroom block next to the Great Hall was access especially during bad weather. A tunnel was built from Grove House to the new building. This tunnel was only partially underground. The east side went along the foundation of the Great Hall. The west side was cement block and the ceiling was poured concrete. The new classrooms were on two levels. The lower classrooms were at the same level as the tunnel. However, this was the equivalent to the basement of Grove House. A set of stairs were constructed to descend from the main floor of Grove House to the tunnel. Over the years, the school continued to grow. New residences were added. Updated recreational facilities became part of the campus. In 1994, the classrooms, labs and special activity rooms were added to and upgraded. In the middle of the fifth decade after they were installed, the steps from Grove House down into the tunnel were retired. In 2016, it will be 50 years since I graduated from Lakefield College School. "The Grove" has grown almost beyond recognition. There are still some points of reference however; the front door to Grove House and the courtyard, the waterfront and that intangible essence that has been felt by all who have been touched by the Lakefield spirit. I have made pieces for Lakefield for several decades. The first wood that I received was from the steps to the tunnel. I also worked with wood from the old chapel: flooring, pews and panelling. In the early 2000s I made pieces from the wood (walnut and maple) from around the building that I knew as "Uplands" which was the home of "Windy" Smith, the headmaster at the time. The piece that I have made for History in the Making comes from the wood from the steps to the tunnel. These are interesting in that, in those days, pine was still the wood of choice. Now we would make steps out of spruce. The pine was not first grade as it has some knots in it. It probably came from Kingdom Lumber in the Village of Lakefield. 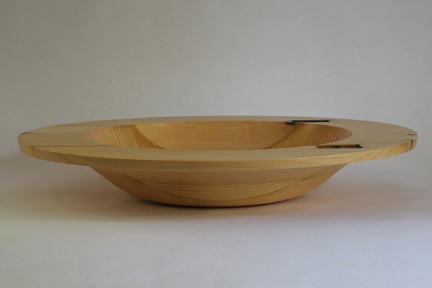 When I laminated the wood I was initially thinking about making a bowl but as I was laying out the pieces I realized that the two points where the metal plates were embedded were evenly spaced and relatively close to the edge. I decided to make a shallow bowl with a wide brim to include these remnants of the previous life. I decided to call the piece "A Step in the Right Direction". 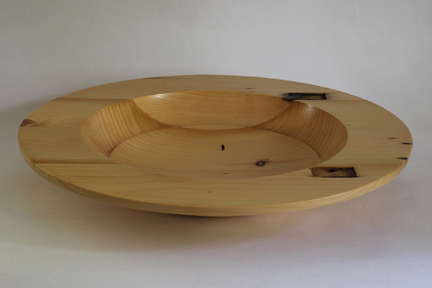 Many of the pieces that I have made from the Lakefield wood have names that have multiple meanings. This bowl is no exception.